Love your dogs? 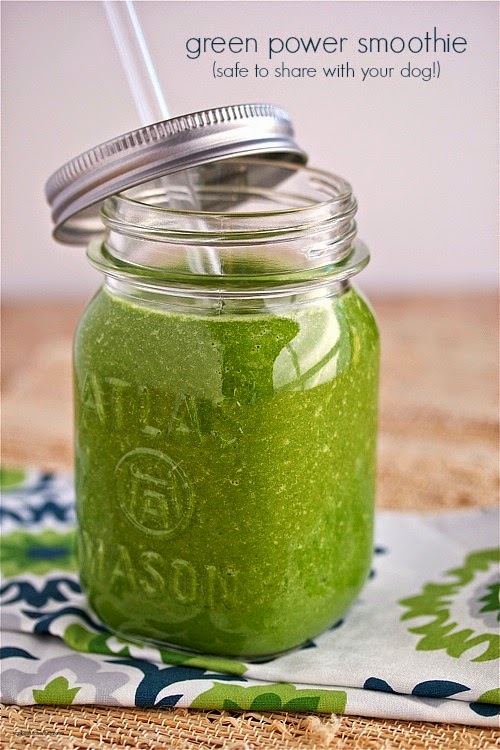 Then share this kale, spinach, peanut butter and banana green power smoothie with them for breakfast. Yesssssss! I'm so excited to share this smoothie post with you because I assume that you, like me, are a crazy dog person. In a good way. Meaning you love dogs. So much so that you may have been known to cook for them. Chicken jerky, sweet potato chips, doggie meatloaf -- all part of my cook-for-dogs-repertoire. But now I've got a doggie breakfast specialty as well, to round out Smoothie Week: a kale and spinach peanut butter smoothie that is not only for them, it's also for you! This easy-to-make smoothie is loaded with healthy ingredients that are good for you but also good (and perfectly safe) for your favorite poochie. And the slightly larger portion size accommodates you both: pour a little bit (start with 1/4 cup for a medium-sized dog) into a bowl for your pal and save the rest for yourself. Learn how to turn nut milk into ice and get other time- and money-saving tips and tricks for making the best smoothies ever. During this year's Detox January, I've been making a lot of smoothies -- and not all of them are green! I know I'm late to the smoothie party (I seem to be late to every party lately), but I'm loving having them for breakfast. One of the reasons I never entirely jumped on the smoothie-a-day bandwagon was because I don't like to clean the blender. SERIOUSLY! I mean, how lazy can you get, right? Last year I discovered (again, apparently this was only news to ME) the mason jar blender trick, which helped a lot; using mason jars means I only have to wash the blender blade -- the jars can go right in the dishwasher. Another reason I wasn't fully embracing smoothies? Smoothie prep. I never seemed to have the right ingredients on hand when I really wanted a smoothie -- namely because they always seem to call for milk or yogurt or some other dairy product I didn't have in the fridge. So one of my new favorite tips for making smoothies easier is nutmilk ice. (Again, if this is not news to anyone but me, keep it to yourself and let me have my little moment of glee, mmmmkay?) 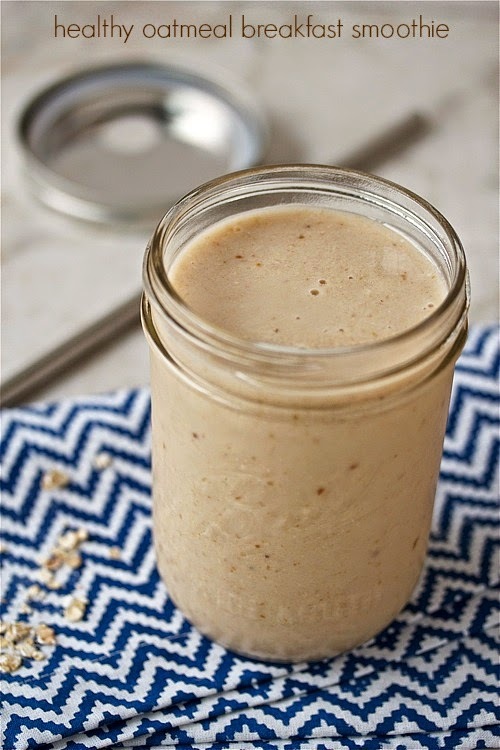 By freezing my favorite nutmilks into ice, I kill two birds with one stone -- nutmilk ice makes the perfect substitute for ice and/or milk in my favorite smoothies. 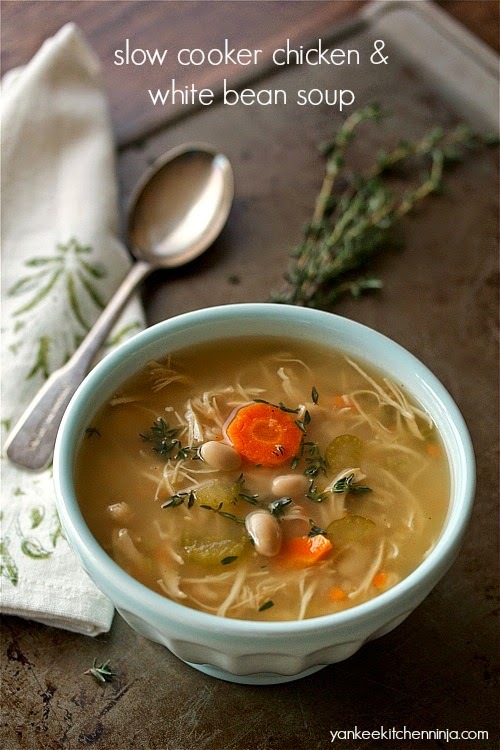 This easy, slow cooker chicken and white bean soup is loaded with two types of protein, fresh herbs and healthy veggies: a perfect warming weeknight dinner. How has the weather been in your area lately? Cold? Snowy? If so, I bet you've been thinking a lot about soup, chili and other warming winter dinners. But no wussy soups for me this time of year. Nosirreebob. The Ninj craves a hearty, filling soup, with protein and veggies, that makes a whole meal in and of itself. 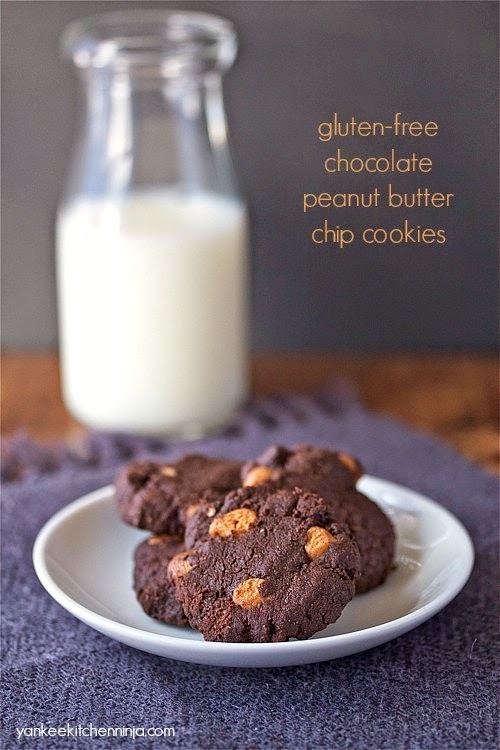 Quick-and-easy double chocolate peanut butter chip cookies: gluten-free, dairy-free and added refined sugar-free -- with a little salty crunch. Sometimes you just need a cookie. Am I right? Can I get an amen? But -- SIGH -- it is still Detox January, so I'm resisting the urge to go mental and make Moonpie cookies or something. I'm trying to keep my healthy-ish hat on. Behold: double chocolate peanut butter chip cookies -- which just so happen to be gluten-free, dairy-free and added-refined-sugar-free. I don't need to eat gluten-free, thank goodness, but I've been finding that I enjoy many of the substitutes that make recipes gluten-free. For instance, this recipe uses almond meal (read: pulverized almonds) instead of traditional flour. I love me some nuttiness and I certainly don't care about the flour, as long as the cookie tastes great. 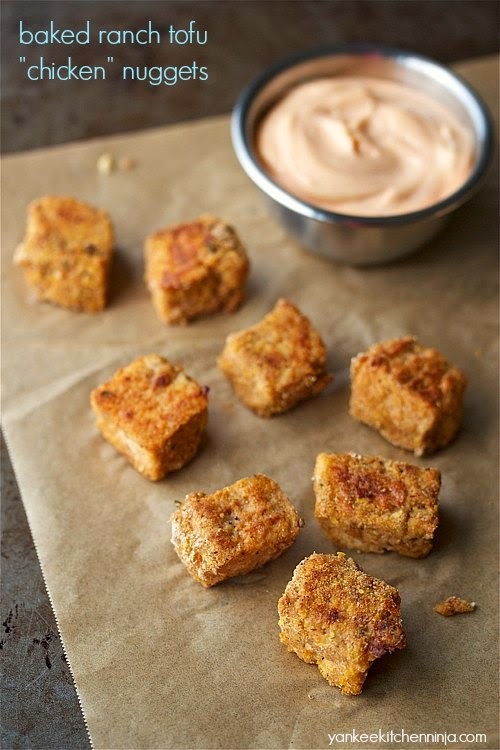 Healthy baked ranch tofu nuggets have all the meatiness and flavor of a traditional chicken nugget. A meatless entree or appetizer that even the pickiest eater will love! So, if you knew me 20 years ago, you're probably laughing hysterically at the fact that I'm posting about tofu. Suffice it to say, I have not always been a healthy eater (I lived on Little Debbie Oatmeal Creme Pies and Cool Ranch Doritos in college). In fact, I was pretty reliant on processed and packaged foods until I started reading more about where my food came from and making the effort to read and decode food package ingredient labels. Even as a healthy eater, espousing The Way of Better Eating, I'm pretty new to tofu, not being vegetarian or vegan (remember -- I have been known to call myself The Meatasaurus). But I've been giving tofu more of a chance lately as a way to enjoy meatless meals during the week. If you've seen but never tried a tofu nugget recipe before, you're not alone. I was super skeptical, especially of the ones that claimed to have a meaty texture. How the freak could jiggly tofu ever seem meaty? But Cheryl of 40 Aprons did a pretty good job of convincing me, once she revealed the secret: Freeze the tofu. Yes! It's totally freakish but it works! 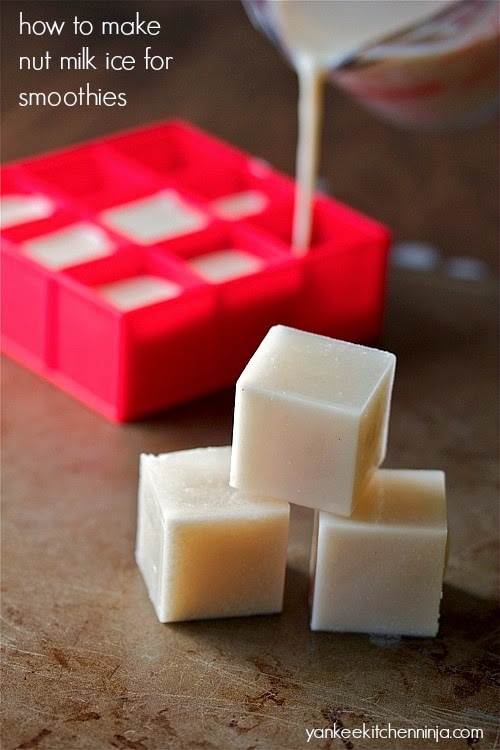 Something all science-y about the freezing and thawing process changes the tofu's texture so that it's meaty. Seriously: meaty. I kid you not. Even Mr. Ninj, who gave me his you-haven't-hidden-some-nasty-pureed-vegetables-in-this-have-you sideways-stink-eye, gobbled them up and praised the meaty, genuinely nugget-ish texture. 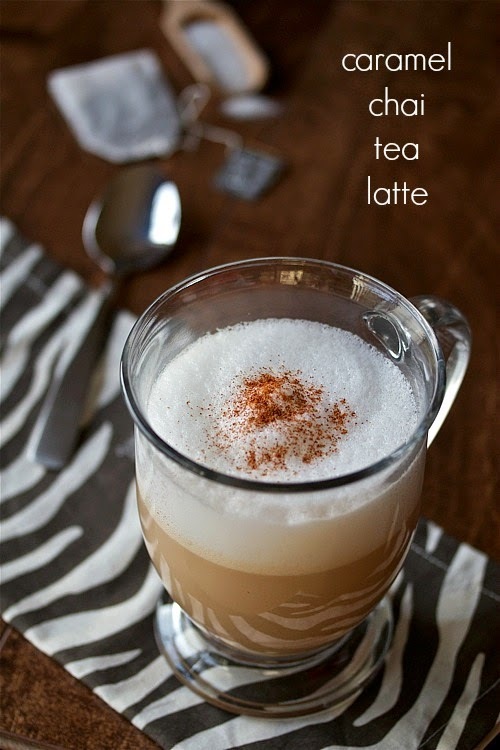 If you're trying to cut back on caffeine and refined sugar this year, swap your pricey coffee shop latte for this easy, rich and delicious DIY caramel chai tea latte. A question for you to consider: How long have you been habitually and automatically drinking coffee to get yourself going in the morning? For me, it began when I was 17 (we won't talk about how long ago that was), a freshman in college ... and I wound up with a schedule of early-morning classes every day. But a few years ago, I spent a week at a British-run resort and started drinking tea every morning instead. I realized I preferred the flavor to coffee, and black tea had enough caffeine (half as much as coffee) to give me the little morning kickstart I needed without giving me the jitters. I never looked back. Well, peeps, it's time to wake up and smell the caramel chai latte, because tea is a great way to help you embrace The Way of Better Eating by cutting back on the amount of caffeine you consume while still giving you that little kickstart you (think you) need. Plus, thanks to the folks at Truvia, you can make even more positive choices and reduce your refined sugar intake by sweetening your latte with their natural, zero-calorie, stevia-plant-based sweetener. Enjoy this lightened yet rich and creamy mac and cheese, loaded with good-for-you collard greens, two ways: gluten-free or not. Eating lighter and adding veggies to your diet doesn't have to mean giving up the foods you love. Case in point: mac and cheese. Regular readers know I'm pretty much addicted to pasta. Even though I know the carb-loading is doing nothing for my waistline, I'm powerless against the pull of cheesy, filling comfort food (seriously: I may need a support group). To make my addiction slightly less bad for me, I've been embracing healthier styles of pasta, like whole wheat pasta and brown rice pastas. The good thing about brown rice pasta is that it's also gluten-free, which I know is an important recipe element to many of you. So, whenever I can, I like to share recipes that can be made gluten-free if needed but don't exclude those who don't eat gluten-free. You've got a love a pasta recipe where everybody wins. 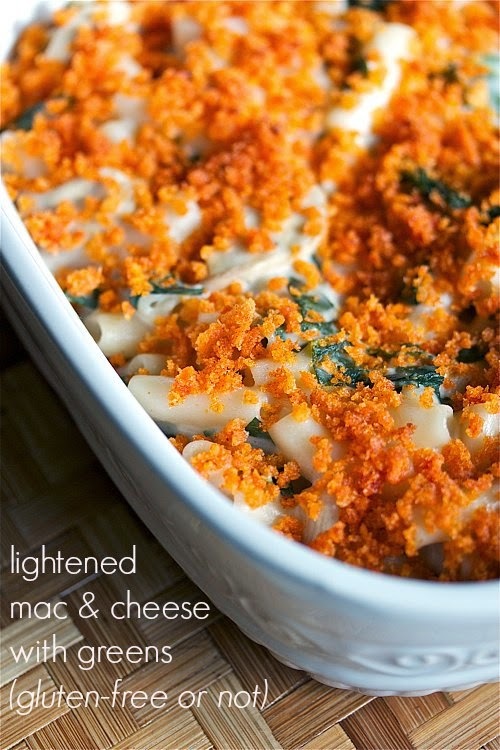 So you're definitely going to love this win-win lightened mac and cheese with collard greens. Collard greens, I hate to say, are terribly misunderstood. If you're one of those people who has only ever tried them braised (I think praising them for their "liquor" is rubbish), with the life cooked out of them so that they're a nasty, sickly green color, I won't blame you if you say you hate them. I hate them cooked that way, too. But you've got to give them another try. Hey, I used to claim to hate pork chops, too, because the only way I ever ate them was the way my mother cooked them: dried out to the point of being inedible unless immersed in a side of applesauce because 1970s cooks worried that pinkish, juicy pork would give us worms ... or worse. Easy overnight chai spiced slow cooker steel cut oats: an individually sized, ready-when-you-are breakfast, hearty enough to keep you satisfied until lunch and away from mid-morning snacks. I love steel cut oats. While regular rolled oats are a staple in my pantry for recipes like baked oatmeal and peanut butter banana oatmeal muffins, I prefer the heartier and chewier steel cut oats, with their slightly nutty flavor, for my hot cereal breakfasts. But steel cut oats can take extra time to cook than quick oats -- and, if you're like me, you don't have a lot of extra time when you're trying to get up and out the door in the morning. So when Quaker asked me to develop a recipe using steel cut oats to inspire you to consider oatmeal in a whole new way for 2015, I jumped at the chance and created this chai spiced slow cooker steel cut oat hot cereal. 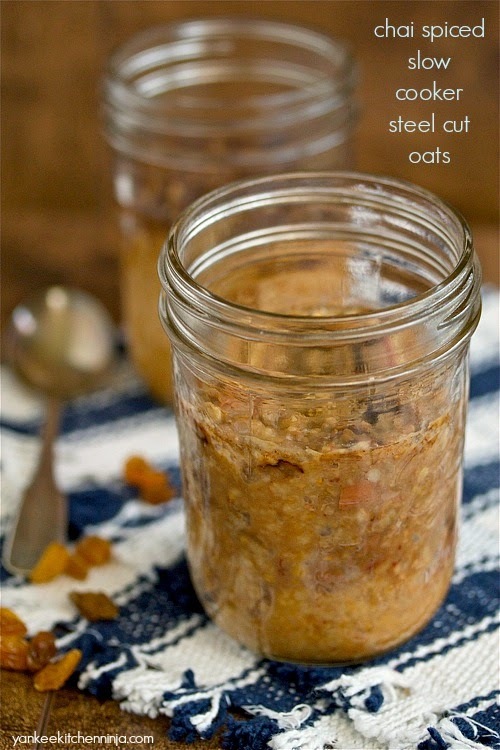 By using your slow cooker while you sleep, you can start enjoying a better-for-you breakfast of steel cut oats easily and without any extra effort -- in fact, with almost no effort at all. The beauty of this whole grain oat breakfast recipe is that it is so easy. Firstly, there are only four ingredients and all of them are readily available at your local Target (as if you need an excuse to shop at Target, right?). Secondly, the recipe is super easy to prep and to cook, as it cooks itself in the slow cooker while you sleep! And thirdly, having a better-for-you whole-grain breakfast waiting for you when you get up is a real morning time-saver. No more excuses for not eating healthier breakfasts in 2015! You'll love the cardamom in these pear and pecan spice muffins, studded with bits of candied ginger. 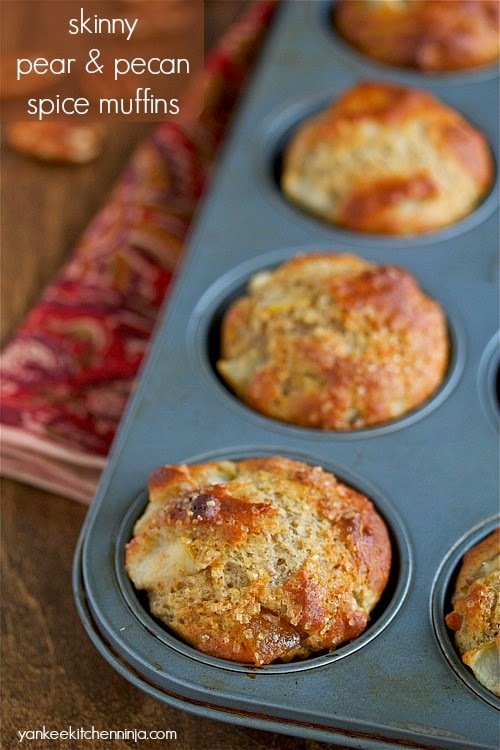 Enjoy the muffins for breakfast or an afternoon snack. HOLLA: It's Detox January again! Regular readers know that Mr. Ninj and I engage in what we call Detox January every year. It's not as bad as it sounds; it's just a way to get back on track with the Way of Better Eating after the excesses of the holidays (yeah, I have no one to blame but myself for those Moonpie cookies). And I encourage you to play along at home. Exercise more than you did in December. And to show you that Detox January isn't some kind of scary juice cleanse or anything, I annually serve up a yummy baked good as the first recipe of the year. This year, it's lightened pear and pecan spice muffins, scented with cardamom and studded with bits of candied ginger. Yes, a "detox" that involves muffins ... 'cause that's how The Ninj rolls.